The St. Charles Parks and Recreation Department maintains an up-to-date inventory of all publicly-owned trees within our parks thanks to a TRIM Grant Award from the Missouri Department of Conservation. The inventory was built by Davey Resource Group using their Tree Keeper Software. This was completely updated in May 2018 and is now available to view online. Over 4,500 trees are inventoried within our park system. The goal of the St. Charles Parks and Recreation Department’s Tree Management Program is to provide healthy, effective tree care to increase the benefits of the urban tree canopy and to provide a safe and sustainable community forest for generations to come. 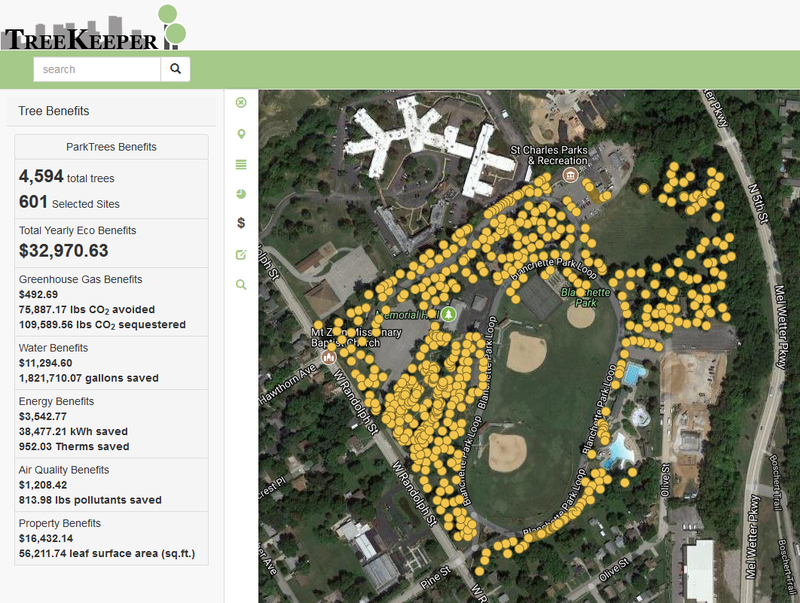 This tree inventory provides an effective tool for managing the urban tree canopy while maximizing resources and efficiency in tree care efforts. Gold Medal Trees – can be seen by using the “Layers” tab. These are the top 8% of the Parks’ most beneficial trees. CLICK HERE to view our Tree Inventory.